Amazon Mini Saver is a program that claims to be able to help you save money by just browsing on amazon.com. 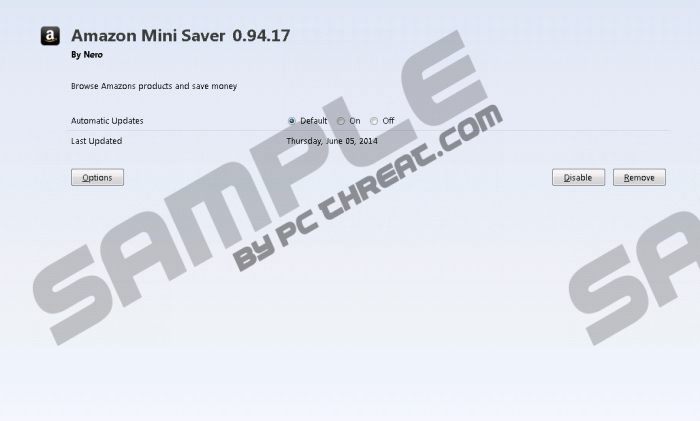 However, it would be too good to be true; the specialists of pcthreat.com have done a research and found out that Amazon Mini Saver is not going to act in a beneficial way because it is just a simple advertising-supported application. It means that it is very probable that various advertisements will appear on your screen. In addition to this, you might see coupons and shopping suggestions as well. Unfortunately, all these commercials might interfere with your browsing processes and even expose you to potential threats, which is why we believe that the cleverest solution would be to remove Amazon Mini Saver and never install it on the system again. As you have probably already understood, Amazon Mini Saver is definitely not going to help you save money. Actually, its main purpose is to drive traffic to particular websites and promote different products. However, it might still expose you to threats even if it is not a very serious infection itself. As we care about your system’s security, we recommend deleting this program from your system. In the meantime, you should definitely ignore all those ads if you do not want to be redirected to corrupted websites. The research has shown that Amazon Mini Saver usually installs itself without permission because it uses a method of silent installation, which means that you do not have any opportunities to refuse the installation of this software. In order not to end up with more serious programs in the future, you should never download software from unreliable websites and it is also very important to pay enough attention to the installation process itself. What is more, you should never open unknown email attachments or click on ads offering to update software (e.g. Java or Flash Player). If you do not like the idea that Amazon Mini Saver is residing on your system, you should know that you can delete it anytime. You can do that manually or automatically depending on your choice; however, keep in mind that manual removal will not remove all the components of Amazon Mini Saver from your system, which is why we still recommend scanning your PC with a reliable antimalware tool, for instance, SpyHunter. Select the program that you are planning to remove. Find Amazon Mini Saver and select it. Access the Metro UI (tap the Windows key). Quick & tested solution for Amazon Mini Saver removal.